If you remove the little rubber rings (that squeeze the leaf) you will see that the leaf clamp can, indeed, hold a standard cuvette. In fact, we designed it to do so. You can get data that way. We have built a prototype version of MultispeQ that is specifically designed for cuvettes. and it works quite well, has cyano-specific wavelengths etc. It'd be interesting to see if there is sufficient interest in this to consider actually producing it. Hi David. If I don't do it "re-positioning it so that the excitation and fluorescence detectors are at 90o to each other". Can I get correct parameters fluorescence from algae? In principle, yes. We have done a few tests, but have not explored it rigorously. One thing that can interfere with results are direct back-scatter of the measuring pulse, which can give you an offset in the fluorescence. I'd recommend testing it out with a series of chlorophyll concentrations to optimize. I'd love to hear about the results, and maybe we can figure out the best way to make it work! Wow, that data looks great. Can you share some details, e.g. chlorophyll content? Also, I would strongly recommend using the new RIDES protocols, as they give much better ECS and P700 data. Anyway, thanks for sharing this. I hope it will inspire others to give it a try. 7 days incubation (1,3,7) with Se, Se+Zn, Se+Cr. Phi2 increasing. Somebody know, why? Have you drawn these Box and Whisker Plots using PhotosynQ platform or someone else software. Plots are nice and interesting. I think increase in SPAD value or chlorophyll contents per reaction center (algal growth and development with time) causing increase in Phi-PSII. Andriy Herts, Nataliia Herts: 7 days incubation (1,3,7) with Se, Se+Zn, Se+Cr. Phi2 increasing. Somebody know, why? 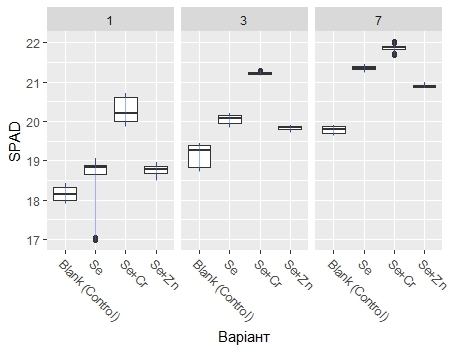 Algal incubation with Se+Cr increased SPAD but it lower Phi-PSII .... ? It may implies to Cr inhibiting effect on PSII efficiency but not on PSII structure, chlorophyll biosynthesis, chloroplastic development. Thank you for your opinion. 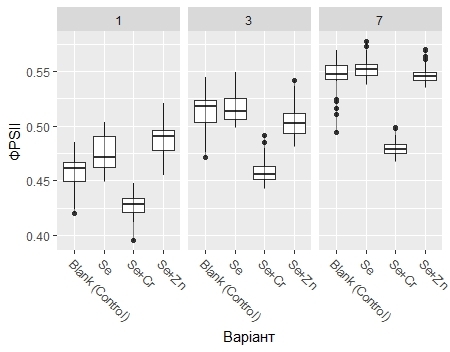 I am using RStudio to build the Boxplots. What the best RIDES protocol for plant and especially for algae now? Habib-ur-Rehman Athar: Algal incubation with Se+Cr increased SPAD but it lower Phi-PSII .... ? It may implies to Cr inhibiting effect on PSII efficiency but not on PSII structure, chlorophyll biosynthesis, chloroplastic development. I think that is the root cause: "With the increase of biomass, the chlorophyll fluorescence absorbed and shaded by the medium also increased, leading to a more reduction of maximum fluorescence (Fm) compared to minimum fluorescence (F0), which resulted in a higher Fv/Fm (1−Fm/F0)".